New Providence Island and Paradise Island, both belonging to the Bahamas, are close enough to be connected by two huge bridges. This is where all similarity ends, however. In fact, the two islands couldn't be more different! The final destination of most tourists is Paradise Island. And no wonder, with such an attractive name! In the past the island was known as Hog Island, due to the numerous 4-legged inhabitants that bear the name "hog". When the big enterprises began to move in and develop the island into a tourist area, the hogs found themselves unwanted and unloved. The Island is currently graced with numerous luxurious hotels and resorts. It is also home to numerous luxurious and expensive homes, most worth several million dollars. The streets are ultra-clean and well maintained, and the native Bahamians are only there to serve the numerous tourists. 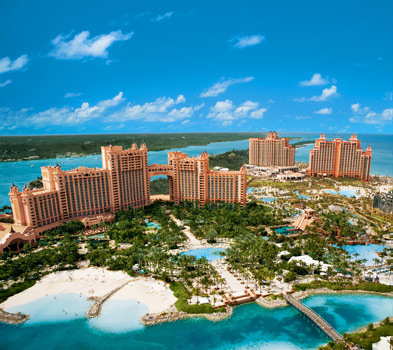 The primary resort on Paradise Island is Atlantis. Atlantis offers rooms for a wide range of prices, but the most expensive two rooms are $25,000 a night, with a minimum of 4 nights' stay. But amazingly enough, these two rooms are supposedly booked solid for the next two years! Atlantis also offers a casino, a water park with numerous slides through shark and stingray infested waters, and a huge, interconnected aquarium, supposedly the largest indoor aquarium in the world. This is the only picture of the Bahamas that most tourists ever see. Would they be left thinking that the Bahamas are one huge amusement park? That they are the home of the rich and famous? But how erroneously wrong they are! If they would have only taken the time to cross the bridge and visit the main island, New Providence, their viewpoint would have been dramatically changed! They would have realized that the Bahamas is much more than a fancy tourist trap. Instead, it is a place of utter beauty filled with wonderful people. They would have found the New Providence beaches intoxicating, its marine life titanic, its history exhilarating, and its local population fascinating. They would have also noticed that though most of the residents are not well off, they don't spend their days worrying about their poverty. They smile, they spend time with their families, they consider others to be as important as themselves, and they enjoy their simple lives to the fullest! Similarly, we often have a distorted view of life itself. We think that life is all about us, and everything is here to satisfy our insatiable yearnings. Our constant cravings for something better leaves us more dead than alive. We are at a dead end, and worse still, we believed life was nothing more than a dead end with no turning around allowed. We were empty and had no way to find real fulfillment. Bur God took care of that by loving us so much that He willingly died so that not only could we obtain life but life in full. Our whole perspective can change. We can leave the island supposedly called "Paradise" and visit the main island of Truth. Dear Lord, we thank You for the abundant life You have for each of us. Help us to get caught in the traps of the world but rather continually look to You for the real joy. In the Name of Jesus, Amen.